Food allergies are the third most common allergy that affects dogs and cats, outranked only by fleabites and inhaled allergens (e.g., pollen). Allergies to common food ingredients are also on the rise and now account for at least 30% of all allergy cases. Unfortunately for many pets, the most common food allergens are also the most common pet food ingredients. Consequently, as a pet owner, identifying and isolating the trigger for a pet’s food allergy can be difficult. The first step in diagnosing a food allergy is to recognize the symptoms. Common food allergy symptoms including excessive itching and scratching. Dogs with a food allergy commonly lick their feet, scoot their rear end in an attempt to scratch it, or have ear problems. 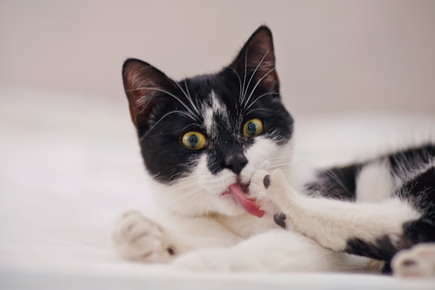 Cats have a wider variety of skin symptoms, almost any pattern of hair loss or scabs can be a sign of an allergy. Food allergies can also cause gastrointestinal problems such as chronic vomiting or soft stools. If a pet suffers from recurring gas or diarrhea, a food allergy may be the cause. Symptoms of a food allergy may slowly build over time as a pet’s immune system mounts an increasingly greater response. It may be several months before hair loss, coat deterioration and skin lesions occur. Food allergies have a genetic basis, although environmental factors can also have an impact. Recent research suggests that different environmental factors in early puppyhood or kittenhood may increase the chance that the immune system overreacts to certain food substances. However, a genetic predisposition for this overreaction must first occur for an allergy to develop. Dogs are most commonly allergic to beef, chicken, and wheat. The most common allergens in cats are fish and dairy. However, any pet can be allergic to any ingredient they have eaten in the past. An elimination diet is the most effective way to determine a food allergen as there is no valid blood or intradermal skin test for food allergies. A veterinarian will recommend a “novel” diet that is entirely different from a pet’s regular food. All protein and carbohydrate sources must be swapped out and fed for a length of time to see if the symptoms disappear or at least lessen. The dog or cat must consume nothing but the novel diet for 8 to 10 weeks. During this time, allergy symptoms should gradually disappear. Next, owners can gradually reintroduce elements of the past diet one ingredient at a time. One ingredient should be introduced and then monitored for one to two weeks. If symptoms return, this ingredient can be confirmed as at least one source for the food allergy. Talk to your veterinarian before beginning an elimination diet.